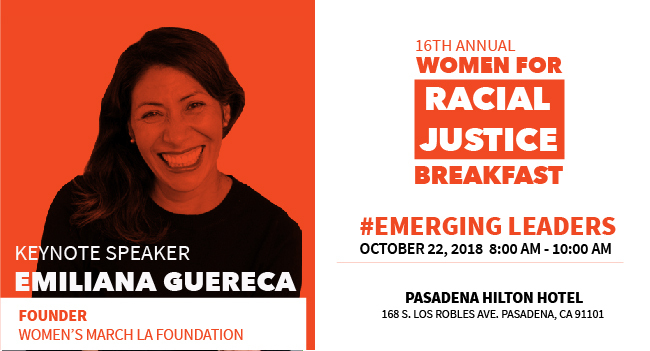 (July 20, 2018) The YWCA Pasadena-Foothill Valley is thrilled to announce that Emiliana Guereca-Zidenfeld, founder of Women’s March LA will be the Keynote Speaker for the 16th Annual Women for Racial Justice Breakfast. The event will be held on Monday, October 22nd, from 8:00 – 10:00 am at the Pasadena Hilton Hotel, located at 168 S. Los Robles Ave in Pasadena. Come celebrate diversity and be a part of the organization’s continued work towards racial justice. Emiliana is an entrepreneur based in Los Angeles, CA, with a passion for giving back to the community. Along with being an award-winning event producer, Emiliana devotes much of her time to advocacy programs for women’s rights, Latino education, and gender equality. As a stellar community organizer, Emiliana brings her 10+ plus years of event experience to Women’s March LA. In 2016, she founded the Women’s March LA Foundation, a non-profit organization, and is the driving force behind the official Women’s March in Los Angeles. Since January, Emiliana has become extremely involved in activism, both on a local and national level, and has served as the bridge between many organizations to combine forces in the Summer of Resistance. Emiliana has spoken to numerous groups, including The League of Women Voters, Cal State Los Angeles, USC, UCLA, and was a panelist at 2017 Politicon, the HOPE Conference, Hispanas Organize for Equality, and the 2018 United State of Women Summit. She is also currently a contributor for Huffington Post.